The Blueprint Program is an innovative and interactive program that leads participants through their collegiate career with a structure for life-long learning. The program has four levels members seek to attain: Initiation, Order of the Founders, Knights of Classic Lore, and Fraternity for Life. This groundbreaking cornerstone program allows participants to select their own curriculum. Each level has three modules: Mental, Moral, and Social Development. Within each module are seven to twelve tasks of which participants are required to complete between two to five. Each member is given an opportunity to complete activities they believe will help them in their future that are both exciting and entertaining. There are individual tasks as well as those that can be completed in a group setting. The program benefits both Tau Kappa Epsilon and each individual member. The organization asks for commitments from both entities that want to adopt this program to ensure its success. The major commitments are that the program will be done devoid of hazing and that the group commits to complete the program in its entirety, not relegating the program to a certain group of individuals within the group. We believe that this will enhance our brotherhood and build better men, which will in turn build a better world. Chapters/Colonies on The Blueprint work with the Offices of the Grand Chapter to have the program installed and connect a local volunteer to the group who will ensure the success and longevity of The Blueprint on that particular campus. For more information or to apply to the program, please print off an application and email, fax, or mail it to Alex Swenson, Programs and Events Manager. As a membership organization, any measures directly affecting the recruitment and retention of members should be given the highest consideration. Rates of Bid Acceptance and the Initiation of Candidates can be reflective of the effectiveness of both recruitment and member education practices. Each of these, but particularly Bid Acceptance, may also provide some indication of the public perceptions on campus of a particular group. Across each semester this past year, the Blueprint groups’ average rates exceeded the General groups’ on both counts – most notably in the percentage of candidates who were initiated. Success in converting candidates to initiated members directly affects overall membership. The average number of initiates this year in Blueprint groups was 16.9, compared to only 11.7 among the General groups. 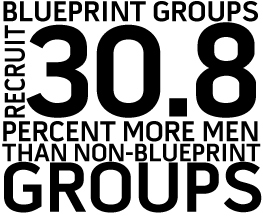 The average size of Blueprint groups, at 42.14, also exceeds that of the General groups at 36.11. Though this is certainly affected by prior size and the generally healthy status of chapters before being approved for the Blueprint, any advantage throughout the recruitment and new member education process resulting in increased initiations will only continue to feed increases in average group size. What influenced your chapter to be a “Blueprint” Group? Our chapter was selected as one of the pilot groups for the Blueprint program. We struggled to fully use the program at first but an alumnus brought it back on our radar. He expressed the importance of the program and how it can do a lot to help the chapter, whether by means of recruitment, completing further extracurricular activities on campus, and improving each Frater as a man. When I looked through the milestones, I thought these tasks were easy enough to complete and that they seemed essential for everyone to be involved in. What successes have you seen in your chapter since implementation of the Blueprint? As we're still in the infant stages of the program, our biggest success has been reengaging our alumni to help mentor the undergraduate members. One of our biggest problems as a chapter has been alumni involvement and to have a program help solve that issue is unbelievable! We have had 40 alumni express interest in mentoring Lambda fraters and each one of us has been in communication with our mentors at least once a month.